Credit: Photo by Axel Krause - In two of the pits 14 right hands were discovered, while two other pits were found holding one right hand each. 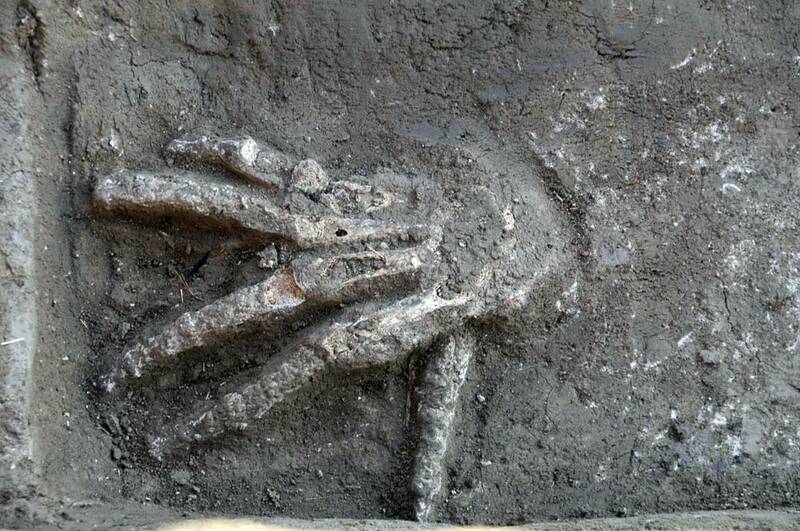 It's not known whom these hands belonged to, they could have been from Egyptians or people in the Levant. 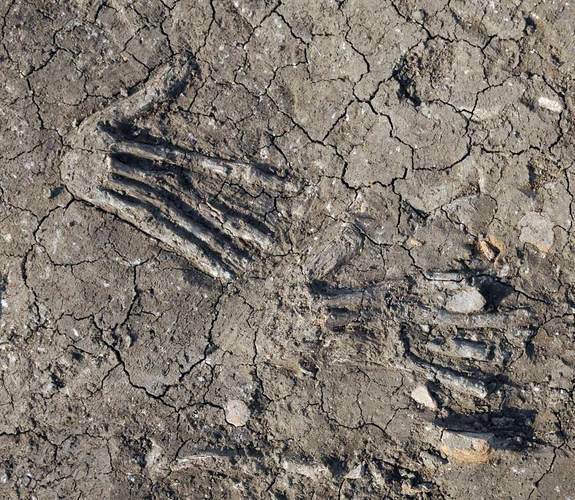 "Most of the hands are quite large and some of them are very large," Manfred Bietak, project and field director of the excavations, told LiveScience. 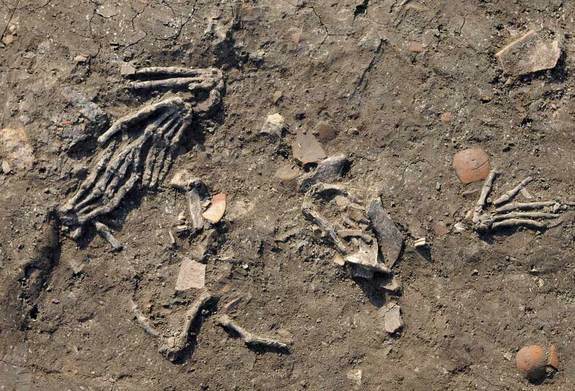 The finds, made in the Nile Delta northeast of Cairo, date back about 3,600 years to a time when the Hyksos, a people believed to be originally from northern Canaan, controlled part of Egypt and made their capital at Avaris a location known today as Tell el-Daba. At the time the hands were buried, the palace was being used by one of the Hyksos rulers, King Khayan. "Our evidence is the earliest evidence and the only physical evidence at all," Bietak said. "Each pit represents a ceremony." Cutting off the right hand, specifically, not only would have made counting victims easier, it would have served the symbolic purpose of taking away an enemy's strength. "You deprive him of his power eternally," Bietak explained. It's not known whose hands they were; they could have been Egyptians or people the Hyksos were fighting in the Levant. Credit: Photo by Axel Krause - Two right hands found in a pit. It's not known who started this gruesome practice of cutting off right hands in exchange for gold. 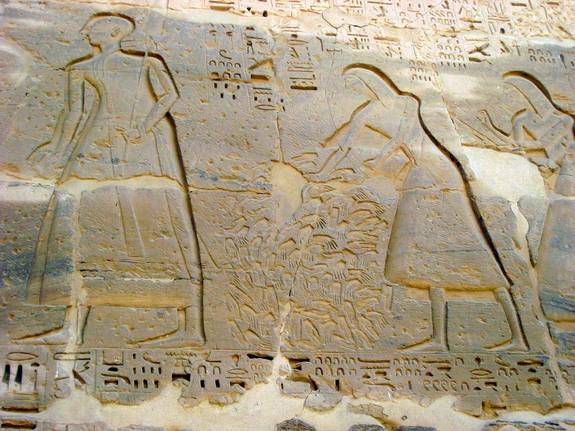 There are no records of it being done in northern Canaan, where the Hyksos are believed to be from. It could have been an Egyptian practice that the Hyksos picked up, it could be vice-versa, or both sides could have gotten it from somewhere else entirely. "Then I fought hand to hand. I brought away a hand. It was reported to the royal herald." For his efforts, the writer was given "the gold of valor" (translation by James Henry Breasted, Ancient Records of Egypt, Volume II, 1905). Later, in a campaign against the Nubians, to the south, Ahmose took three hands and was given "gold in double measure," the inscription suggests. 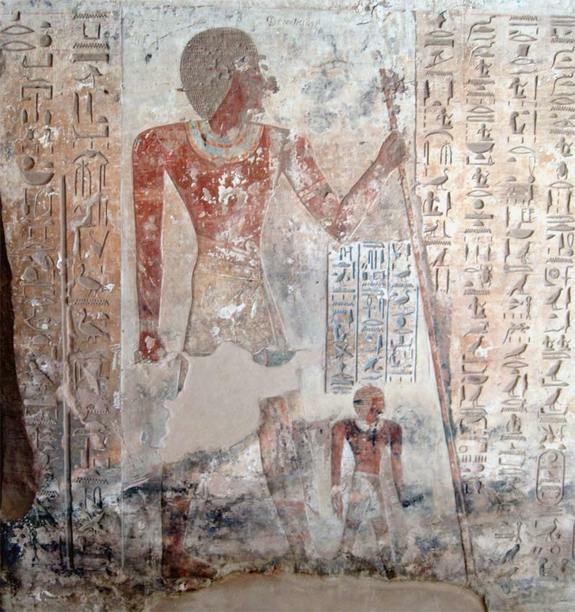 Credit: (Photo by Olaf Tausch CC Attribution 3.0 Unported - Ahmose, son of Ibana, was an Egyptian soldier who fought under several pharaohs, participating in campaigns against the Hyksos and Nubians. His tomb records that he received the "gold of valor" for chopping off the hand of a Hyksos soldier and presenting it as a trophy. Scientists are not certain who started this gruesome tradition. No records of the practice have been found in the Hyksos' likely homeland of northern Canaan, Bietak said, so could have been an Egyptian tradition they picked up, or vice versa, or it could have originated from somewhere else. 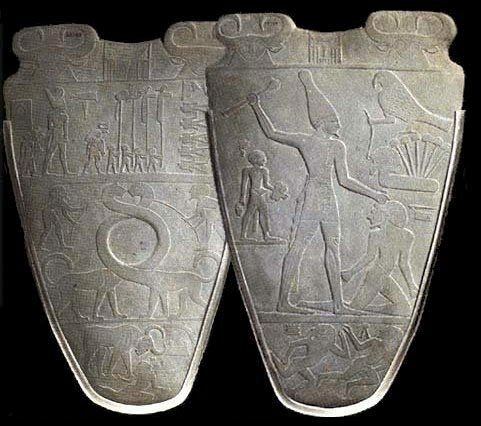 Credit: Image courtesy wikimedia, CC universal public domain - The Narmer palette, dating back about 5,000 years to the time of Egyptian unification, shows decapitated prisoners and a pharaoh about to smash a man's head. Although it predates the new Avaris evidence by more than a millennium, it shows, in graphic detail, the poor treatment of prisoners in ancient Egypt. Credit: Photo by Karen Green, CC Attribution share-alike 2.0 generic - This image was created about 400 years after the Avaris hands were deposited. It shows the chopped-off hands of enemy soldiers being prepared for Ramses III, a pharaoh of Egypt, after a successful campaign.